The first artist in our Artists in Residence series for 2019 is textile artist and interior designer Barbette Houser. WUGA will celebrate her work on Saturday, February 16th. Barbette distills visual ideas from nature and beautiful hand-made items into simplified, abstract interpretations in quilted pieces that vibrate with light and energy. 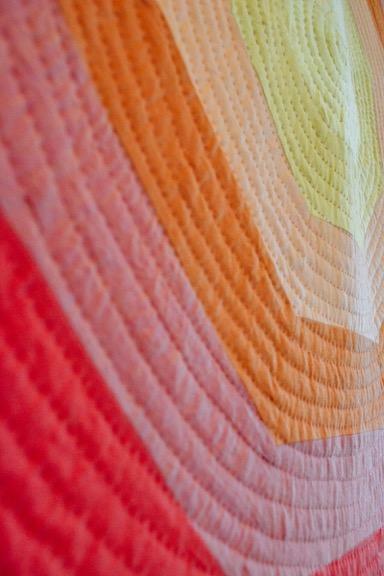 She first exhibited her quilts in a solo show at the Meyers Gallery at Athens Academy in 2013. Her most recent group show was “Stitch” at the Classic Center in 2018-2019. Over the past twenty years she has gathered together a stunning collection of Mid-Century Scandinavian furniture and design, vintage textiles, and works by Athens-area artists. Her 1920s cottage in Five Points that she has restored, remodeled, and expanded is an important visual project in itself! Barbette also writes about and takes photos of the work of local artists in her blog for flagpole.com. A graduate of the Savannah College of Art and Design, she taught art for seven years. The event at her beautiful home will be held rain or shine — with delicious hors d’oeuvres, lemonade and tea catered by Marti’s at Midday and terrific wine supplied by Uncommon Gourmet. Didi Dunphy, head of the Lyndon House, will speak briefly about Barbette's work at the event. Admission is $15 for Friends of WUGA and $20 for nonmembers. Friends memberships are $30 or more annually. The facts about the event in a nutshell: Featured artist: Barbette Houser 3 - 5 pm on Saturday, February 16. A benefit for public radio station WUGA. $15 for Friends of WUGA; 20 for non-members. Friends memberships are $30 or more annually. On August 25th WUGA will celebrate the very diverse work of conceptual artist, ideationist, and product and graphic designer Michael Oliveri, an Associate Professor at the Lamar Dodd School of Art at UGA. He’s the founder of the school’s ArtX program, where students meld creativity with technical experimentation in a wide array of forms. He holds an M.F.A. (in New Genre studies) from UCLA and his B.F.A. from the San Francisco Art Institute, where he studied sculpture. On June 16th, WUGA is celebrating local cartoonist and illustrator Eleanor Davis, whose colorful and distinctive illustrations often appear in the New York Times and in The New Yorker. Last year NPR included Eleanor’s book You & a Bike & a Road in their list of best books of 2017. An earlier book of her comics, called How to be Happy, was included in NPR’s reader poll last year of the top 100 graphic and comic novels.